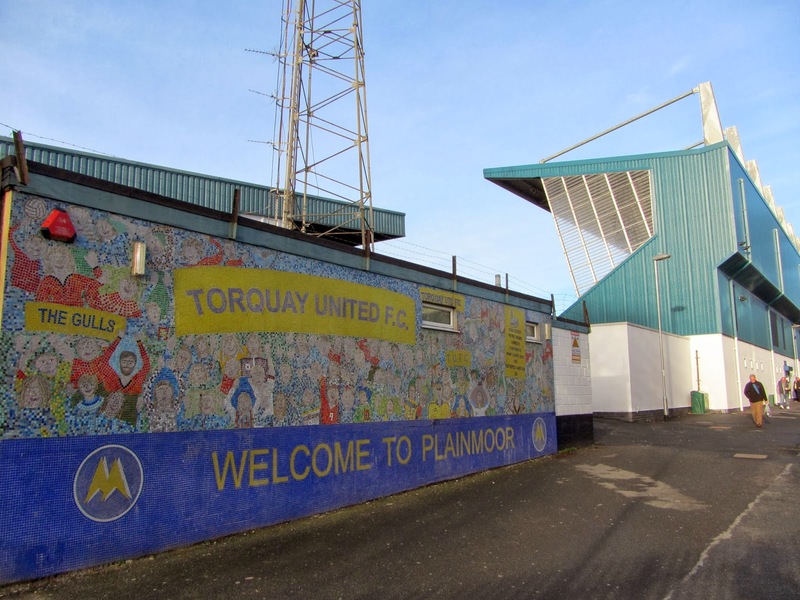 My twenty-ninth stadium of 2013 was on Sunday 29th December 2013 at Plainmoor in Torquay, Devon. The match was Torquay United vs. Exeter City in Football League Two. Plainmoor is located in a built-up area of the town and is tightly packed in between housing and a school. The closest railway station is Torre which is just over a mile away with Torquay railway station around 1.5 miles from the ground. 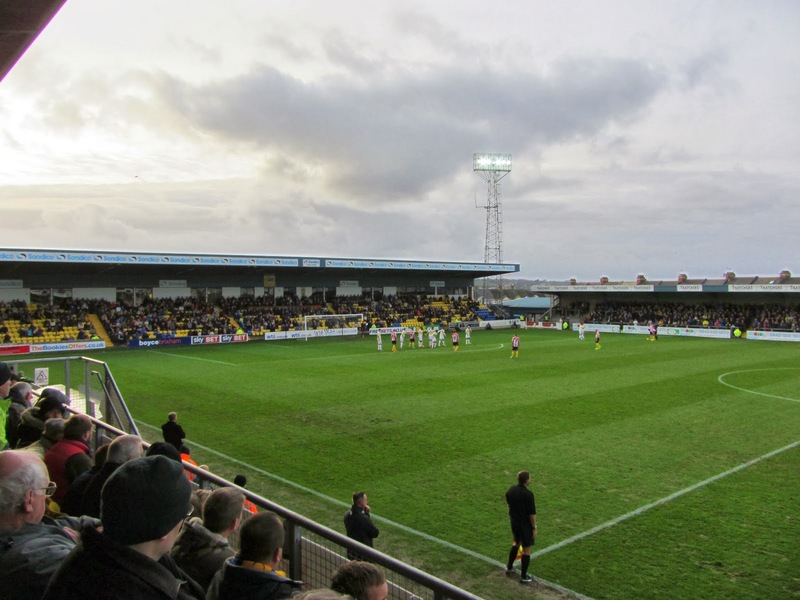 Plainmoor has been home to Torquay United since 1910. 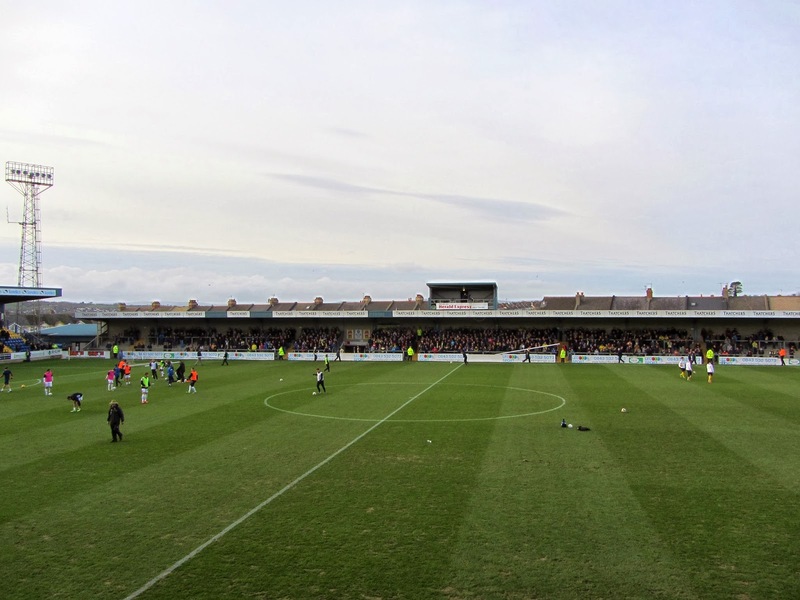 Plainmoor consists of two all-seater stands and two terraced stands and has an overall capacity of 6,500. The newest stand, Bristow's Bench, was completed in 2012 and runs most of the length of the pitch on the south-east side of the venue. The stand contains seats for 1,750 fans as well as the press area and newly renovated dressing rooms. The structure is raised above the pitch and so is the tallest stand in the ground. The other all-seater stand in the venue is the Family Stand which sits behind the goal in the south-west section of Plainmoor. This 1,200 seat structure also contains executive boxes at the back of it. The remainder of the ground is taken up with covered terracing. The Marnham Road side of Plainmoor has a television gantry located on top of it and it also contains the Torquay United indoor bowls club. 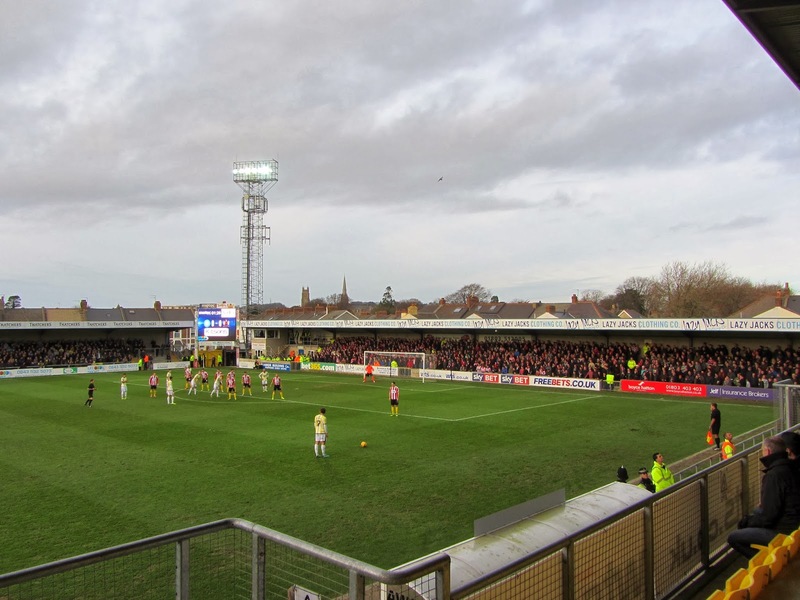 The Warbro Road end of the ground sits behind the goal at the north-east area of Plainmoor and is given over to away fans. A police control box is located at one end of this stand so the away fans do not extend for the whole length of the stand. When visiting teams bring large followings, as was the case with Exeter, they are also given a section seating in Bristow's Bench. Torquay suffered a poor start to the season but entered this game off the back of two wins and a draw which gave them hope in their aim of avoiding the drop. They were presented with the opportunity to take the lead from the penalty spot in the 7th minute when Liam Sercombe's mistimed tackle sent Billy Bodin tumbling in the area. Karl Hawley struck a decent penalty but Artur Krysiak made an excellent save to deny him the opener. The hosts were the better side in the first half but despite their build-up play didn't test Krysiak's goal very often. In the 38th minute Exeter notched up the opening goal against the run of play. Tom Nicholls made a run down the left before unleashing a low drive from 25 yards which beat Michael Poke at his near post. This spurred Exeter into action and they put in an improved second half display. Just before the hour mark David Wheeler escaped the attentions of three Torquay defenders before running in on goal and slotting the ball neatly into the bottom of the net to make it 2-0 to the away side. Just when it looked like Exeter could run away with the game Torquay introduced substitute Elliot Benyon into the fray and within minute his cross had been turned in by Karl Hawley to reduce the deficit with 16 minutes remaining. The hosts then ploughed forward in search of an equaliser but in the 85th minute Exeter got the crucial third goal when Alan Gow dispossessed Anthony O'Connor close to goal and slid the ball past Michael Poke to wrap up three points for the visitors.